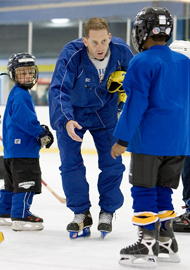 Learn to Play Hockey is designed to teach and strengthen basic skating and hockey skills. The classes prepare players for in-house or travel league play. Qualified instructors guarantee adequate attention to all players because of small teacher to student ratios. Hockey 1 is for the beginning player.The focus of the course will to develop the players skating skills as well as introduce puck and sticking handling skills. . Players with little ice skating experience are encouraged to start in the Learn to Skate to play hockey class, participants need to be able to have basic skating skills to enroll in Hockey 1. All skaters who have never participated in a Learn to Play hockey session at UD should begin with Hockey I and if necessary, can be moved up after the first week with the coach’s recommendation. Hockey 2 is for players who have completed Hockey 1 or possess a similar skill level. This session will focus on strengthening existing skating and puck control skills as well as developing shooting skills needed to begin game play. Players, age 8 or younger, who have enough skill and comfort with the game, are welcome to join the Cross-Ice Hockey League after passing Hockey 2. Hockey 3 players have completed Hockey 2 or have considerable background in the game of hockey. Skills are further developed in preparation for introduction to game situations and In-House Hockey. A Learn to Play Hockey student who has passed all three levels will be skilled at forward skating and crossovers, backward skating and crossovers, hockey stops, passing and puck receiving skills, shooting skills (forehand & backhand) and Introductory game skills. Skates, helmets with cages, hockey gloves and hockey sticks are required for all classes. Shin guards, kneepads and elbow pads are highly recommended because of some drills performed. The Ice Arenas provides ALL equipment if needed, including stick, gloves, helmet, elboe and shin pads and skates. We also have a limited number of hockey rental equipment bags which can be reserved the first day of class. Please call ahead with your skate sizes to ensure they are sharpened and ready on your first day. *Fee includes skates, helmet, stick and gloves if necessary. Class on April 27 8-845am due to AG Day. *Fee includes skates, helmet, stick, gloves and other eqiupment if necessary. Cost is $100 per player for the Spring Program. 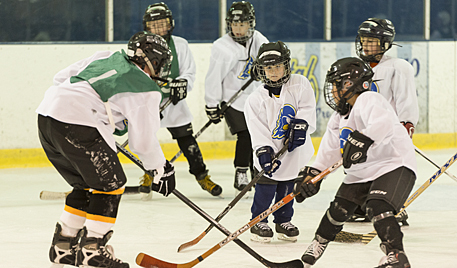 Learn to Skate to Play Hockey Classes are offered on Wednesday evenings. This class is designed for those players learning how to skate for hockey. Class is NOT designed for players in Hockey 1, 2 or 3. .
Click HERE to register on line registration. All refunds are subject to a $20 processing fee; no refunds will be provided after the 2nd week of class; unless for medical reasons and then the refund will be pro-rated. If you need to rent skates, call prior to the first day and leave a message at (302) 831-6038 or e-mail kaden@udel.edu with your requested size(s). If you would like to borrow a full set of equipment for the season, please call ahead at (302) 831-6038 or e-mail kaden@udel.edu. We will have a specific date to fit equipment for any players that would like to borrow equipment. You must attend one of these dates to receive the equipment. ONLY players in Hockey 2 or 3 will need FULL equipment. We will provide you with a jersey the first day of class. Players will receive certificate and participation medal upon completion of class. Call (302) 831-6038 or e-mail kaden@udel.edu with any questions you have about the program.